It's not news that the brain changes with age. Significant changes in regions of the brain occur in healthy adults as they age, based on MRI studies.1 The caudate, cerebellum, hippocampus, and association cortices shrunk substantially. This shrinkage in the hippocampus and the cerebellum accelerates with age. The hippocampus, the site for new memory formation, is involved with learning and emotion with a rich supply of estrogen and progesterone receptors. The cerebellum coordinates voluntary movements including all conscious muscular activity, balance, coordination, and speech. The incidence of Alzheimer's dementia can be used as a measurement of brain health.5 As part of his study "Exercise Is Associated With Reduced Risk for Incident Dementia Among Persons 65 Years of Age and Older," Eric B. Larson, MD, MPH, et al asked 1,740 mentally healthy men and women over the age of 65 how many days per week over the past year they had exercised for at least 15 minutes. The incidence of Alzheimer's disease (AD) was significantly higher for individuals who exercised fewer than three times per week (19.7 per 1,000 person-years) compared with those who exercised more than three times per week (13 per 1,000 person-years). These results were not influenced by the E4 alleles on the apolipoprotein gene, which indicates a genetic predisposition for AD. Laura Podewils et al studied the relationship between physical activity and dementia in 3,375 men and women over the course of 5.4 years.6 Physical activity in these individuals over the age of 65 was assessed via the Minnesota Leisure Time Questionnaire. The subjects were questioned regarding the frequency and duration of their physical activity over the previous two weeks. Like Larson et al, this study found that increased exercise decreased the incidence of Alzheimer's dementia. The Mini-Mental State Exam can be used as a measure of cognitive ability or impairment. 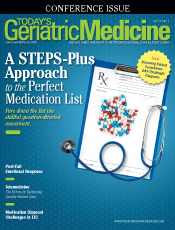 The 30-point questionnaire commonly used by health care providers screens for dementia, evaluates cognitive impairment, and follows cognitive change over time, making it an effective way to document an individual's response to treatment.7 Kristine Yaffe, MD, et al used the Mini-Mental State Exam to show that cognitive performance increases as the number of blocks walked per week increases.8 The study involved 5,925 women over the age of 65 over a six- to eight-year period. AD, the most common form of dementia, shares many age-related pathophysiological features of type 2 diabetes, including insulin resistance, disrupted glucose metabolism in nonneural tissues, peripheral oxidative and inflammatory stress, amyloid aggregation, neural atrophy, and cognitive decline. Brain insulin resistance appears to be an early and common feature of AD, a phenomenon accompanied by IGF-1 resistance, promoting cognitive decline independent of classic AD pathology.14 Such a large set of shared features suggests shared etiologies. — Robert Drapkin, MD, a medical oncologist and competitive bodybuilder in Clearwater, Florida, specializes in helping elderly adults achieve a healthful lifestyle to combat illnesses or disease and to extend lifespan. 1. Raz N, Lindenberger U, Rodrigue KM, et al. Regional brain changes in aging healthy adults: general trends, individual differences and modifiers. Cereb Cortex. 2005;15(11):1676-1689. 2. Chapman DP, Williams SM, Strine TW, Anda RF, Moore MJ. Dementia and its implications for public health. Prev Chronic Dis. 2006;3(2):A34. 3. Hendrie HC. Epidemiology of dementia and Alzheimer's disease. Am J Geriatr Psychiatry. 1998;6(2 Suppl 1):S3-S18. 4. The Blessed Orientation-Memory-Concentration Test. University of Missouri Geriatric Examination Tool Kit website. http://geriatrictoolkit.missouri.edu/cog/bomc.pdf. 5. Larson EB, Wang L, Bowen JD, et al. Exercise is associated with reduced risk for incident dementia among persons 65 years of age and older. Ann Intern Med. 2006;144(2):73-81. 6. Podewils LJ, Guallar E, Kuller LH, et al. Physical activity, APOE genotype, and dementia risk: findings from the Cardiovascular Health Cognition Study. Am J Epidemiol. 2005;161(7):639-651. 7. Pangman VC, Sloan J, Guse L. An examination of psychometric properties of the mini-mental state examination and the standardized mini-mental state examination: implications for clinical practice. Appl Nurs Res. 2000;13(4):209-213. 8. Yaffe K, Barnes D, Nevitt M, Lui LY, Covinsky K. A prospective study of physical activity and cognitive decline in elderly women: women who walk. Arch Intern Med. 2001;161(14):1703-1708. 9. Barnes DE, Yaffe K, Satariano WA, Tager IB. A longitudinal study of cardiorespiratory fitness and cognitive function in healthy older adults. J Am Geriatr Soc. 2003;51(4):459-465. 10. Colcombe S, Kramer AF. Fitness effects on the cognitive function of older adults: a meta-analytic study. Psychol Sci. 2003;14(2):125-130. 11. Colcombe SJ, Kramer AF, Erickson KI, et al. Cardiovascular fitness, cortical plasticity, and aging. Proc Natl Acad Sci U S A. 2004;101(9):3316-3321. 12. Kramer AF, Erickson KI, Colcombe SJ. Exercise, cognition, and the aging brain. J Appl Physiol (1985). 2006;101(4):1237-1242. 13. Knüsel B, Winslow JW, Rosenthal A, et al. Promotion of central cholinergic and dopaminergic neuron differentiation by brain-derived neurotrophic factor but not neurotrophin 3. Proc Natl Acad Sci U S A. 1991;88(3):961-965. 14. Talbot K, Wang HY, Kazi H, et al. Demonstrated brain insulin resistance in Alzheimer's disease patients is associated with IGF-1 resistance, IRS-1 dysregulation, and cognitive decline. J Clin Invest. 2012;122(4):1316-1338. 15. Gibala M. Molecular responses to high-intensity interval exercise. Appl Physiol Nutr Metab. 2009;34(3):428-432. 16. Billat VL. Interval training for performance: a scientific and empirical practice. Special recommendations for middle- and long-distance running. Part I: anaerobic interval training. Sports Med. 2001;31(1):13-31.